Treatment for the various types of lymphoma include chemotherapy, radiation therapy, radioimmunotherapy, and immunotherapy (monoclonal antibodies).3 The use of rituximab (Rituxan), an anti-CD20 monoclonal antibody, in combination with chemotherapy, has improved clinical outcomes for patients with follicular lymphoma.4-6 However, disease relapse is common, even in patients who achieve complete response.1,7 Indeed, the disease may relapse in some patients, or become refractory to rituximab-containing regimens.4,6 Thus, there is a need for additional therapeutic options to address an unmet need for patients with follicular lymphoma. Obinutuzumab, a CD20-directed monoclonal antibody, is a new treatment option for patients with follicular lymphoma whose disease relapsed after, or is refractory to, a rituximab-containing regimen. In the phase 3 GADOLIN study, treatment with obinutuzumab plus bendamustine, resulted in a significant improvement in PFS and reduction of disease worsening versus bendamustine alone. The median PFS had not yet been reached with the combination. 1. National Cancer Institute. Adult non-Hodgkin lymphoma treatment (PDQ)—health professional version. www.cancer.gov/types/lymphoma/hp/adult-nhl-treatment-pdq. Accessed January 23, 2017. 2. National Cancer Institute. SEER cancer stat facts: non-Hodgkin lymphoma. https://seer.cancer.gov/statfacts/html/nhl.html. Accessed January 23, 2017. 3. Mayo Clinic staff. Diseases and conditions: non-Hodgkin’s lymphoma: definition. January 28, 2016. www.mayoclinic.org/diseases-conditions/non-hodgkins-lymphoma/basics/definition/con-20027792. Accessed January 23, 2017. 4. Gabellier L, Cartron G. Obinutuzumab for relapsed or refractory indolent non-Hodgkin’s lymphomas. Ther Adv Hematol. 2016;7:85-93. 5. Hiddemann W, Kneba M, Dreyling M, et al. Frontline therapy with rituximab added to the combination of cyclophosphamide, doxorubicin, vincristine, and prednisone (CHOP) significantly improves the outcome for patients with advanced-stage follicular lymphoma compared with therapy with CHOP alone: results of a prospective randomized study of the German Low-Grade Lymphoma Study Group. Blood. 2005;106:3725-3732. 6. Sehn LH, Chua N, Mayer J, et al. 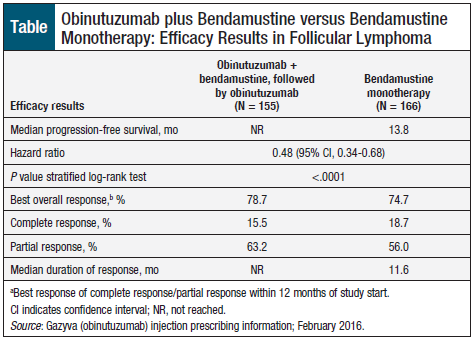 Obinutuzumab plus bendamustine versus bendamustine monotherapy in patients with rituximab-refractory indolent non-Hodgkin lymphoma (GADOLIN): a randomised, controlled, open-label, multicentre, phase 3 trial. Lancet Oncol. 2016;17:1081-1093. 7. Kahl BS, Yang DT. Follicular lymphoma: evolving therapeutic strategies. Blood. 2016;127:2055-2063. Erratum in: Blood. 2016;128:463. 8. US Food and Drug Administration. Obinutuzumab. www.fda.gov/Drugs/InformationOnDrugs/ApprovedDrugs/ucm488013.htm. Accessed January 23, 2016. 9. Gazyva (obinutuzumab) injection [prescribing information]. South San Francisco, CA: Genentech; February 2016. 10. Genentech. Gazyva distribution. www.genentech-access.com/hcp/brands/gazyva/learn-about-our-services/product-distribution.html. Accessed January 23, 2017.